In tune with its status as a Green Hotel, Element Kuala Lumpur will eschew natural fir trees for a 1.8m-tall “green” Christmas tree, so guests and customers will be soak in festive ambience with a tree in the lobby that’s made from recyclable materials such as toilet rolls, PVC pipes, magazine covers and cardboards. And if you need more help with the imagination, Christmas carols playing softly in the background will put you in the mood as you look out the glass windows to admire the twinkling lights of the city and the Petronas Twin Towers. Meanwhile, at its Trace Restaurant & Bar, the chefs have designs on the festive culinary spread. 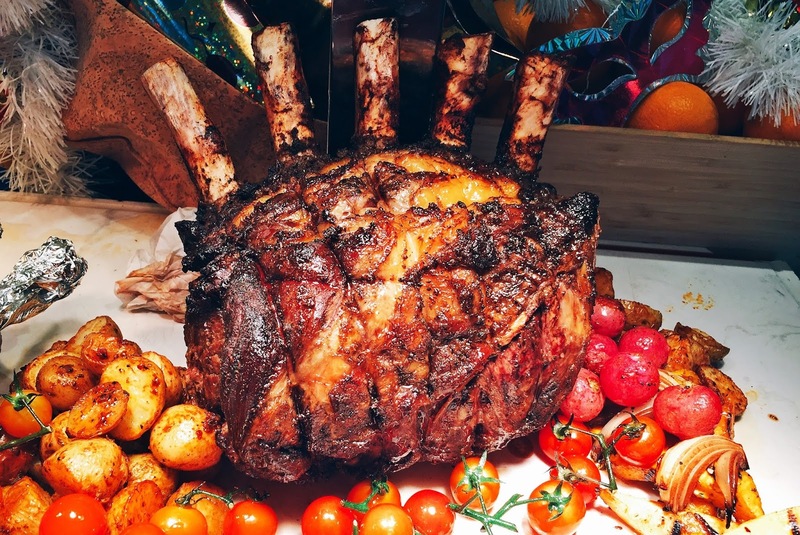 In the kitchen, the team led by Chef Man, will be roasting Australian Angus Prime Rib (marinated with Texan spices and sous-vide for 12-hours), Glazed Honey-Spiced Whole Roasted Turkey and Roasted Duck while adding festive touches to pastries, log cakes and cupcakes. The tables are draped with chains of gold beads and baubles with gold dust to add to the luxuriant atmosphere. Diners are greeted with a glass of Tipsy CandyCane, a festive cocktail created with dry gin, vermouth and tonic water. In the drink are delicious fresh berries and a sprig of fresh rosemary, with a candy cane hooked over the edge of the glass. The stars of the buffet are, naturally, the roasts. Golden brown and glistening, both the duck and turkey make stiff competitors for attention. Very, very few places offer duck for Christmas, so it’s a pleasant surprise, especially when the duck is so flavoursome and goes fabulously with the orange sauce and roasted radishes. If you find that too sweet, the mushroom sauce does an equally decent pairing with the ducky. Meanwhile, My Best Friend is engrossed in the Angus Rib, pausing just long enough to give me the thumbs-up sign. There’s also satay which, though not exactly Christmas fare, is worth second helpings. There’s beef, lamb and chicken. While I didn’t try the beef, the lamb and chicken are delicious and don’t even need the peanut sauce provided. Apart from the sizzling roasts mentioned, the buffet has a host of extravagant festive offerings that include Salmon Gravlax, Chicken Stew with Olive & Root Vegetables, Vegetarian Lasagna, Roasted Vegetables, Onion Bread Stuffing and Lamb Chops which, unfortunately, look rather dry. And it is rather well done but surprisingly still juicy. Have it with mint or mushroom sauce. I love the roasted vegetables. There’s Baby Carrot, Baby Radish and Pumpkin as well as Balsamic Roasted Onion, Brussel Sprouts and Oven-baked New Potato with Beef Bacon Strips. Most of all, the roasted Zucchini and Capsicum are so good I’d be contented to munch on these alone. There’s a whole section devoted to Japanese items, from sushi, maki and sashimi to Tuna Tataki with Dried Fruit Salsa & Wasabi Mayo and fish mousse. I love the sashimi choices of the freshest salmon, tuna and octopus. Then there’s seafood on ice, including mussel, flower crab, prawn and oysters), prawn with cream cheese and little glasses filled with egg salad. A whole Norwegian Salmon Trout is hot smoked and then skinned. Thin slivers of cucumber are arranged on it to resemble scales. It lies on a bed of salad greens and rosettes of smoked salmon. The dessert table beckons. There’s Fruit Cake, a 2m-long Yule Log, Gingerbread Men and Gingerbread Houses as well as decorative cupcakes, Christmas Pudding with vanilla sauce and a cheese board with grapes and strawberries. Prices inclusive of Christmas Cocktail, ginger bread decoration, mystery gift and other surprises. 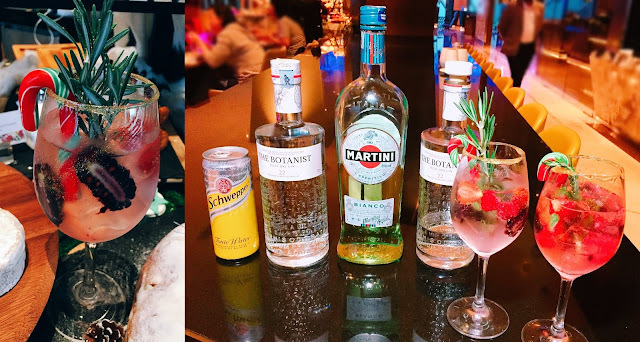 Add RM100 for free flow wine/cocktail.